DENMARK TOWNSHIP - Large aircrafts are making use of the Northeast Ohio Regional Airport this spring. Ashtabula County Airport Authority members discussed recent and upcoming landings at the airport during their meeting last Wednesday, April 3. On March 26, the airport was used by a Dassault Falcon 2000 owned by Green Bay Packaging, Inc., based out of Green Bay, Wisconsin. Ashtabula County Airport Authority Board of Trustees President Dwight Bowden said that, to his knowledge, this aircraft has not visited the NEORA before. “This aircraft is used extensively, including international travel,” Bowden said. Falcon 900 trijet, with transcontinental range. Ashtabula County Airport Authority Board member David Price had the opportunity to tour the Falcon after it landed. “It was quite nice on the inside,” Price said. That compliment was one of the first things he said, Price said. “Which was pretty good, because we worked hard on the runway,” Price said. 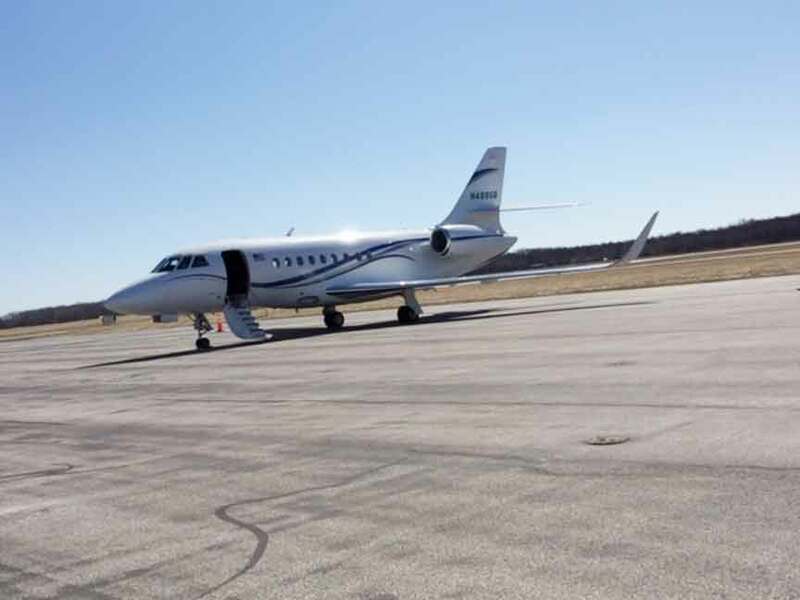 Following the meeting, the board was informed by NetJets, a fractional ownership provider and supporter of the ACAA, that two jets were to be arriving that evening, a Cessna Citation Sovereign 350 and a Challenger 350. Both are twin jets. In May, the airport is expecting a visit from a Gulfstream 650, or G650. While the owner of the aircraft cannot be identified at this time for privacy reasons, Bowden shared that the owner of this aircraft has visited the NEORA before on business in a smaller aircraft. This aircraft’s landing will be a significant milestone for the airport. “To my knowledge, the G650 is the largest aircraft to use the airport. This aircraft is capable of flying nonstop to nearly any airport in the world,” Bowden said. For some info on the G650, it is the biggest, fastest, most luxurious and most technologically-advanced jet that Gulfstream has ever built, with the longest range. Gulfstream engineers partnered with a customer advisory board to envision an aircraft that would set a new standard in business travel. Working from that input, engineers pushed for more performance in every aspect. With the G650’s long, unfettered wing, they redefined how air flows over an aircraft wing, creating a highly efficient airfoil that delivers speed and a smooth ride. The G650 is a jet that flies at more than 92 percent of the speed of sound for thousands of miles with fly-by-wire precision. It can seat up to 19 passengers, and sleep up to 10. During the meeting on Wednesday, Ashtabula County Airport Authority Board member Lance Bushweiler shared that he has been in discussion with the dispatcher about the G650 coming. With the work of the dispatcher and the chief pilot, they were able to determine that, yes, the NEORA can handle the flight. “It’s a good win for the airport for sure,” Bushweiler said. The Ashtabula County Airport Authority was created by a single-page Resolution by the Ashtabula County commissioners on July 29, 1965. “This document and the vision of the founders captures the significance of the airport to the taxpayers of Ashtabula County and the region. The airport was constructed to be an economic driver and development tool for the county,” Bowden said. Throughout its history, Bowden said the ACAA/NEORA has acquired equipment to service most business aircraft, including those referenced above. The members of the Airport Authority tout the NEORA as being an economic driver for the county. “While we hope that jet arrivals result in the sale of fuel or other services, the fact remains that the airport is facilitating commerce within the county as part of the county transportation infrastructure,” Bowden said. In recent years, the NEORA underwent a runway reconstruction, with a 703-foot runway extension and a Runway Safety Area which is compliant to current safety design standards with the Ohio Department of Transportation and the Federal Aviation Administration, resulting in a 5,900-foot runway capable of serving almost any business or private aircraft in the nation’s fleet. “The reconstruction of the runway to current ODOT and FAA safety and design standards, as well as other improvements funded by over $12 million in FAA and ODOT grants, allows the operators of these aircraft to safely arrive and depart Ashtabula County,” Bowden said. The NEORA is one of only two fully compliant land-based airports in Ohio out of approximately 100 public general aviation airports, Bowden said. With Petmin USA’s pig-iron plant coming to the Ashtabula Harbor, it is believed that the airport is going to be very important to how that project is put together. People who wish to see other recent activity at the airport may visit flightaware.com/live/airport/KHZY. Ashtabula County Airport Authority Board member David Price shared this photo of the Falcon on the ramp.